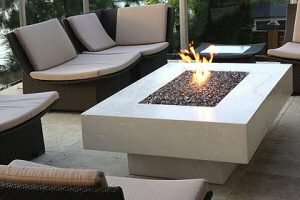 Fire tables have grown in popularity in Edmonton in recent years and although they offer minimal heating ability, they are a wonderful, simple way to spruce up your outdoor space. As a consumer, it’s important to bear in mind there are a wide selection of fire tables available on the market, but it must be CSA-approved in order for it to be installed and insured. If we can share more of our insight and expertise and help you with your fire table installation, please contact us today.